For this week's exclusive offer from Rewarding Times, we are offering a stunning Swift Lamp from Tipperary Lighting for only €165, reduced from €275. This stylish 18" contemporary lamp with black accents, complete with black thread shade makes a stunning addition to any room. Tipperary Lighting is a division of Tipperary Crystal, an Irish crystal design and manufacturing company founded in 1987 by former Waterford Crystal craftsmen. Tipperary Crystal has long been renowned for its high quality crystal and is an established leader in crystal design and production. Our designers and master craftsmen are amongst the most highly respected in the industry and are recognised as leaders in their field. Their innovation and modern thinking combine traditional techniques acquired over generations with modern cutting edge design. Our product range includes both Classical and Contemporary designs to suit every style and budget. Our bespoke chandeliers hang in many fine residences and commercial locations throughout the world. Under the expert guidance of our head designer Martin Croke we have collaborated with interior designers and architects in the USA, Middle East and UK to create unique designs to suit their projects. From concept to completion we are passionate about our products and committed to creating beautiful items that will delight our customers and enhance their homes and business places. Our experts are readily available to discuss and advise on all requirements and are extensively experienced in dealing with both large and small projects. Vouchers must be redeeemed between April 11th and June 30th 2016. 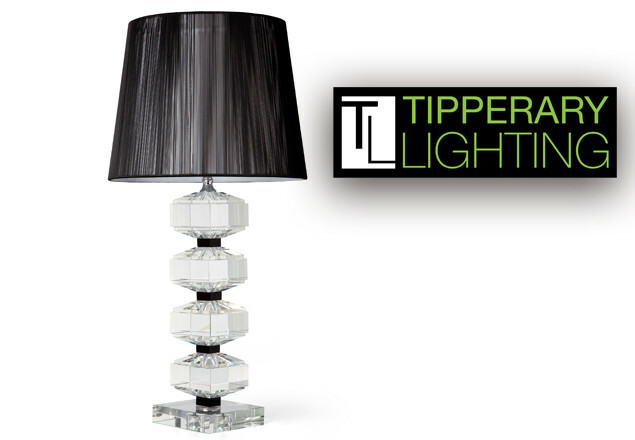 You can collect the lamp from the Tipperary Lighting showroom, Unit 17 Churchtown Business Park, Churchtown, Dublin 14. If you wish to get the lamp delivered, please contact Tipperary Lighting for a quote.